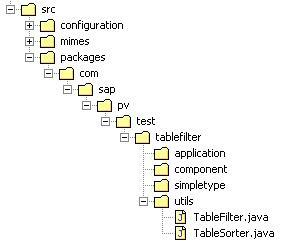 Want a SAP Web Dynpro filtering tool that's as easy to implement and to use as the Table Sorter Java Class? This article by Peter Vignet, reposted from SDN, provides such a tool. 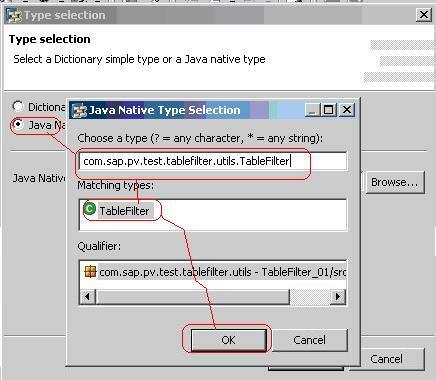 Generic Web Dynpro Java Table filter Web Dynpro Table offers a Table Sorter Java class that can be used directly with very few lines of coding to sort any table. It is powerful tool that is easy to implement and use. 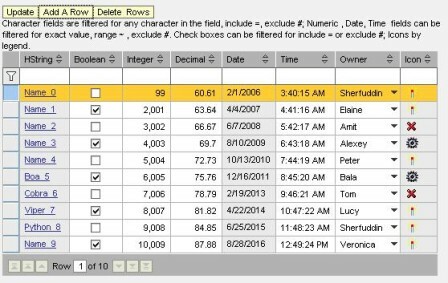 Web Dynpro Table offers also a filtering possibility through the filtering row. The Filtering row is the first row and only the UI is provided; the filtering action is not. The logic of the filter process is not implemented in Web Dynpro. 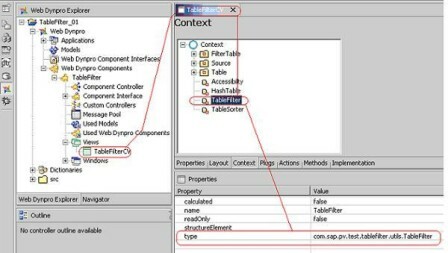 The application developer must implement the filtering action to be executed (see SAP UI Web Dynpro Table documentation). The Java class described below offers a filtering tool that is as easy to implement and to use as the Table Sorter Java Class. When the TableFilters filter action is triggered, the filter method passes two nodes. 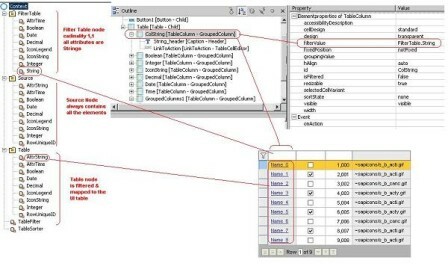 The first node contains all the data and the tables node, the node that shows the data. 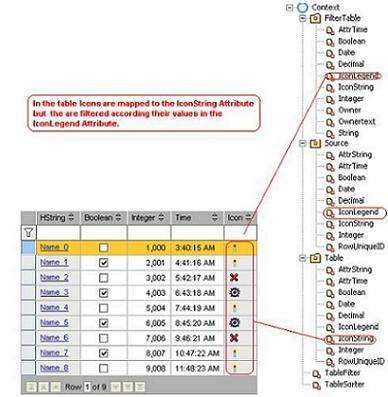 The TableFilter populates the table node from the all data node according the filter values. Filtering is done for each filter value of each column; only the row matching all the filters are shown. Strings: if the filter value is a a it returns any fields that as a a whatever is in the position of the a in the string and it does not makes difference between uppercase and lowercase. It also accepts the # (exclude) or (=) include sign in first position. Numeric values, dates, times: It filters for the exact value, a range(~), include(=), exclude(#) sign. The include or exclude sign should be in first position. Boolean values: Booleans can be filtered using include (=) or exclude (#). Icons: Icons can be filtered according their legends. Legend is language dependent. Icon legends can be shown as a tool tip of the icon. First we will speak about the quick default implementation. Then we will see how we can improve the default implementation. 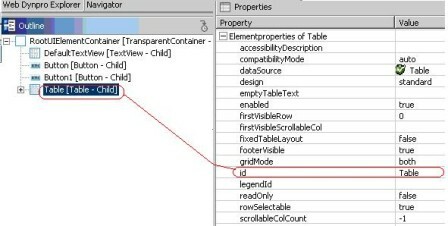 The default implementation assumes that the table node is a value node and dropdown and icons, if any, in the table are not filtered and no columns are update-able. At the first instance of wdDoModifyView, initialize the table filter. The constructor of the table filter for each column finds the associated filter and the needed comparator to perform the column filtering. The text could be like this: Character fields are filtered for any character in the field, include =, exclude #. Numeric, Date fields can be filtered for exact value, range ~ , exclude # ; Check boxes can be filtered for include = or exclude #; Icon by legend. 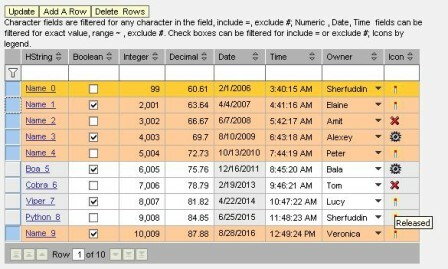 The default implementation can be improved to filter icons, dropdown and update the All data node if the table has been updated or if the table had some rows that have been added or deleted. A icon is filtered according its legend. 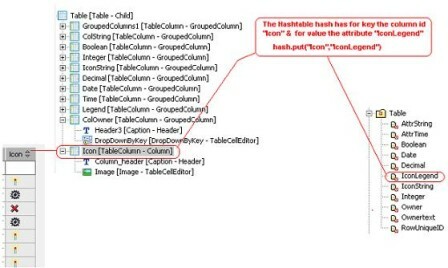 You need, in the all data node and the table node, an attribute for the legend icons (legend icon are language dependent and will have to be translated), so in the TableFilter constructor the last parameter is a hashtable that indicates the mapping between the icon column ids and the icon legend attribute. Since the dropdown shows text but the column value is a key, the filtering must be done the same way the icon filtering is done. This means that at the initialization, the hashtable indicates a mapping between the dropdown column and the node attribute to filter. In our example, the column shown is owner, but the filtering is done on the attribute ownertext. String attributeRowId: is the attribute name that uniquely identifies the row; this attribute is of type String. 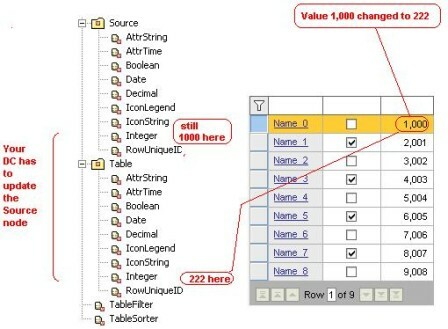 Boolean addRowonFly: if a row has been added in the table, not only the updated existing row will be updated in AllDataNode but if a row has been created, if the flag is set to true, a new element is created in the AllDataNode. String attributeRowId is the attribute name that uniquely identifies the row; this attribute is of type String. ArrayList idsToDelete: contains a list of the unique row identifier to delete. Coming back to our example, the table has now three buttons Update,Add  & Delete  for adding or deleting a row. 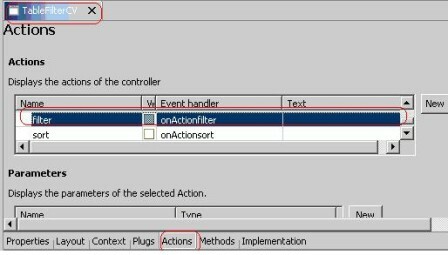 If you initiate the TableFilter with the AllDataNode fully populated and the data are not changed, when using the filter action, you can pass a null instead of a the AllDataNode and the method will retrieve the data from the AllDataNode you pass at the initialization. Or the last time you passed it through the filter action. Peter Vignet joined SAP Labs, Palo Alto, as a senior developer in 2001 for WebDynpro Composite Applications on NetWeaver platform. Want to read more from this author? Click here to read Peter Vignet's weblog. Click here to read more about Web Dynpro on SDN.